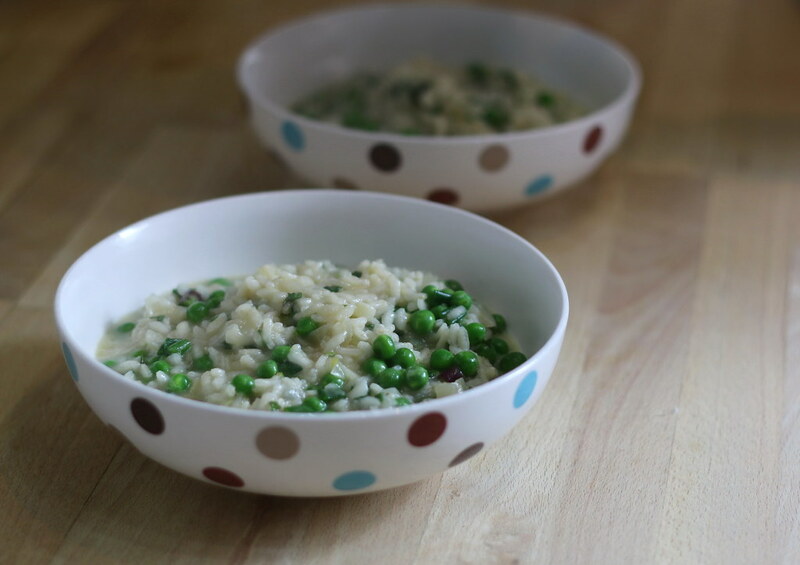 When I saw the veg this week, this light risotto jumped out at me. It's still filling enough for a main meal, but full of light, fresh flavours. In a large heavy-based pan, heat the oil. Gently fry the onion and white parts of the spring onion with the salt until soft and translucent. Don't let them burn - turn the heat down if necessary. Add the garlic and arborio rice and cook for a further minute or two, until coated in oil. Add the Parmesan rind, if you have it. Turn the heat up to medium high. Add the stock a ladle at a time, waiting for it to be absorbed before adding more. Your rice mixture should be bubbling quite vigorously. When all the stock has been added, add the peas for the final few minutes of cooking. Once your rice and peas are cooked to your liking (I prefer mine al dente so only cook for 2-3 mins at this point), turn the heat off. Add the grated Parmesan, green parts of the spring onion and mint and season to taste. Remove and discard the Parmesan rind. Serve immediately.